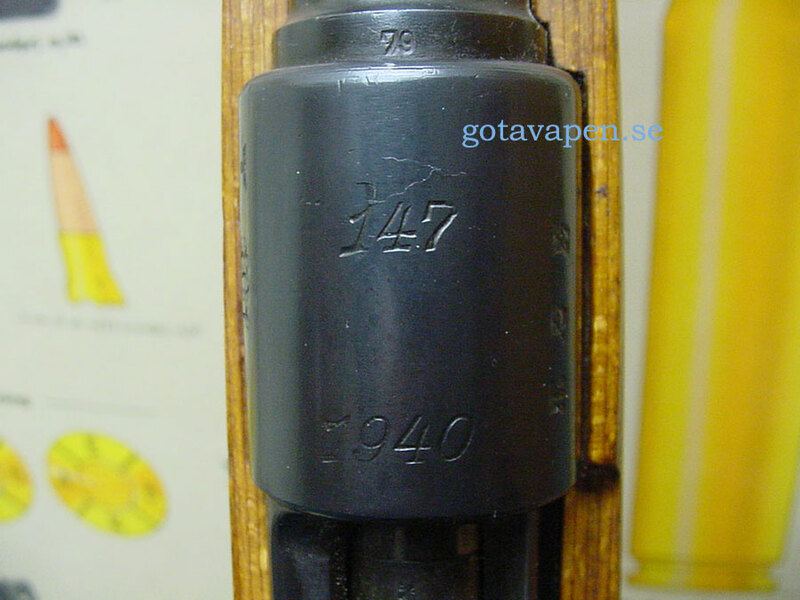 This Swedish rifle m/39 has never been changed to m/40 and the provenance is clear – it was sold by Carl Gustafs Gun Factory to a collector complete with original bayonet. 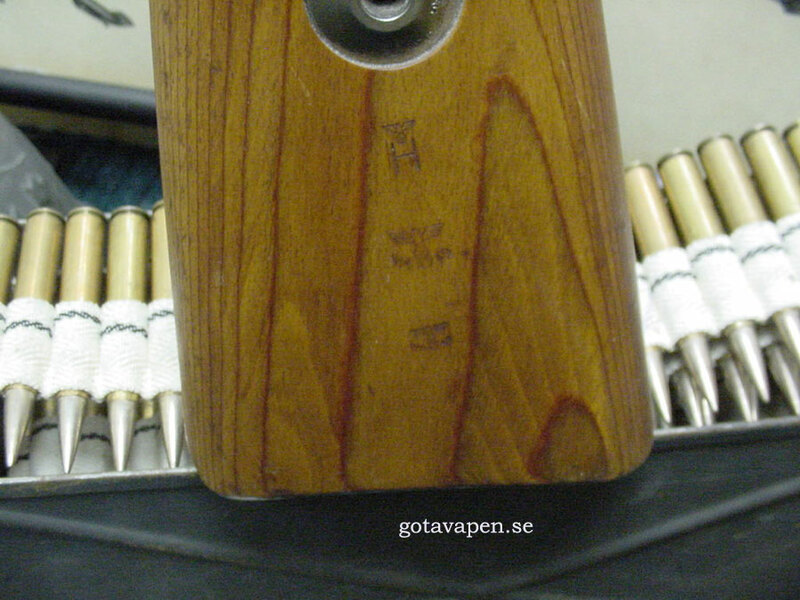 1939 Sweden bought 5 000 rifles K98k from Germany in 7.9x58 mm. The calibre was called patron 8 mm m/39. 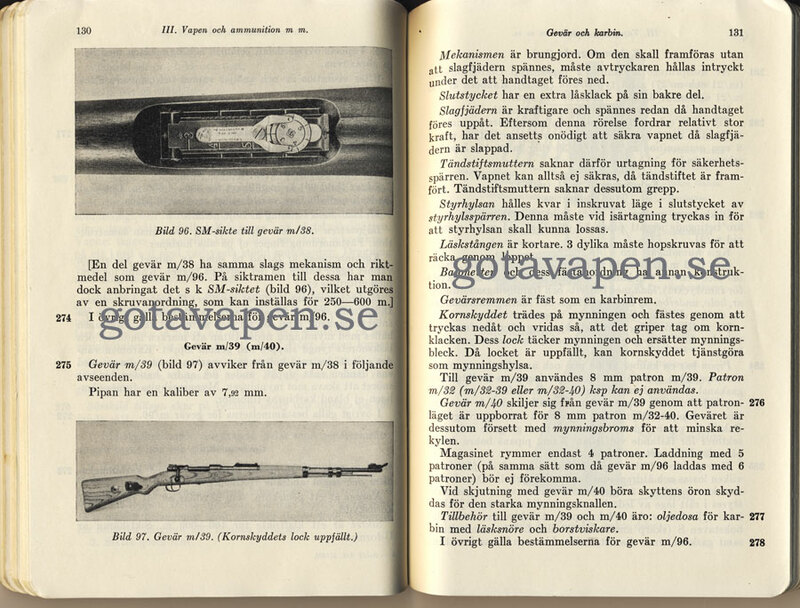 According to the Swedish Military archives these rifles were called Pansargevar m/39 (Anti-tank rifle m/39) or Pvg m/39. This was a very determined acquisition. Swedish Military have always been bound by the very limited budget. Some military has a tendency to look at the last war not the next. Tank regiments were at this time a new branch of the army. The Swedish tanks at this time were made of very inferior armour and had very weak guns. These tanks had no chance to deal with the fast developing German tanks. Whatever the Military real reasons were they decided to buy a standard 7.9 mm K98k rifle as an Anti-tank gun 1939! Together with the rifles followed a similar amount of German bayonets model 84/98 which were called m/39 in Sweden. These m/39 were like K98k equipped with wooden laminated stocks. When these rifle arrived at the Carl Gustaf Stads gun factory Gustaf Bjorkenstam took one of the rifles at the front and smashed the stock against the big anvil. The stock remained intact! The initials GB is the acceptance mark of Cpt Gustaf Bjorkenstam (1942 he became Major). Very soon the military realized that this cartridge could not perform as an Anti-tank cartridge and they decided to change the calibre to something more potent. 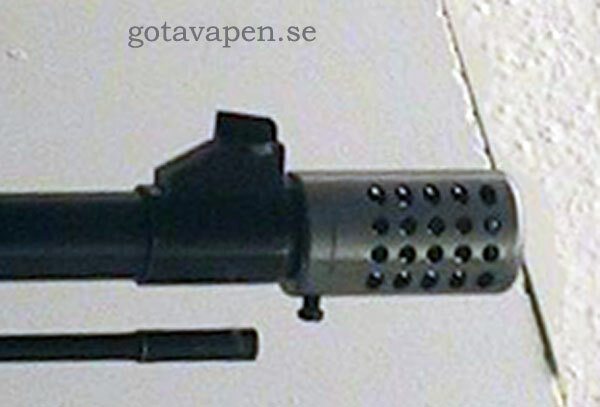 In Sweden there existed already a strong cartridge for Machine-guns 8 mm m/32. The choice was simple – the K98k were re-chambered. The chamber was extended to fit the old Swedish cartridge 8x62 mm and all of a sudden the rifle fitted for patron m32-39 an m/32-40. The magazine capacity became reduced to only 4 cartridges due to the larger cases. The soldier instructions warned against loading with a fifth cartridge in the chamber, the rifle should only be loaded with 4 cartridges. This rifle was now called pansarvarnsgevar m/40 (Anti-tank rifle m/40) or Pvg m/40. 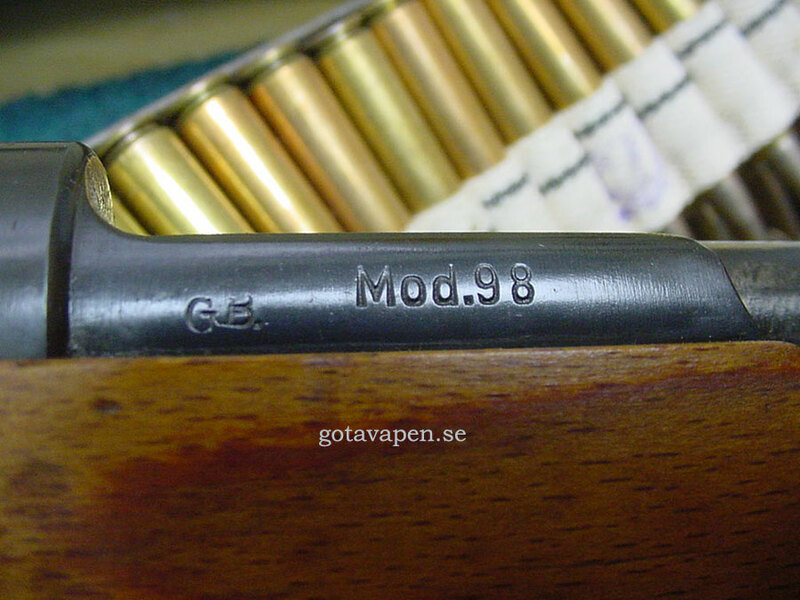 After 1940 there are no reports about the terminology pvg m/39 or pvg m/40 any more, the guns were now called Gevar m/39 and Gevar m/40. 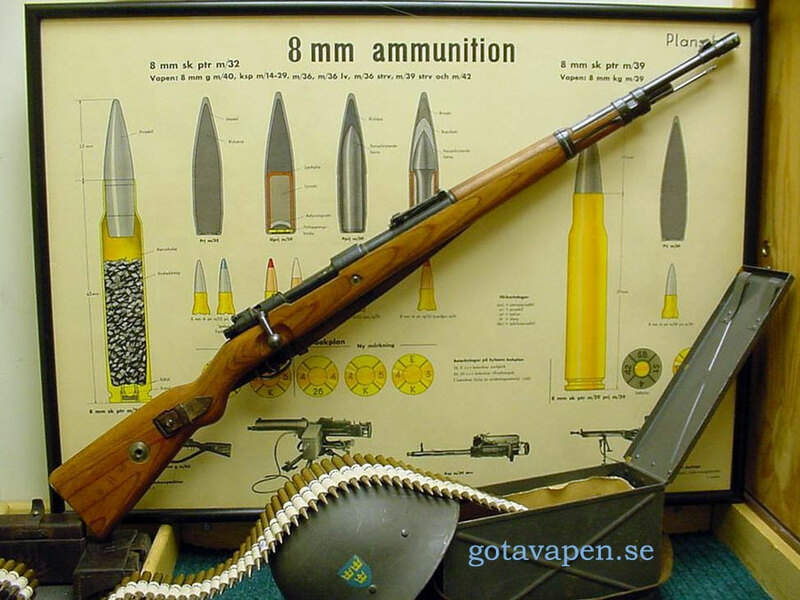 On the picture above there is a wall chart showing the two types of cartridges “sk ptr 8mm m/39” (German) and “sk ptr 8mm m/32” (Swedish). Below on the picture you can see the different weapons for these cartridges. at the Weapon Museum in Eskilstuna (which is closed now due to lack of money). Some of these rifles m/40 had side rail mounts for sniping scope Ajack (Swedish m/41), which also was bought from Germany. 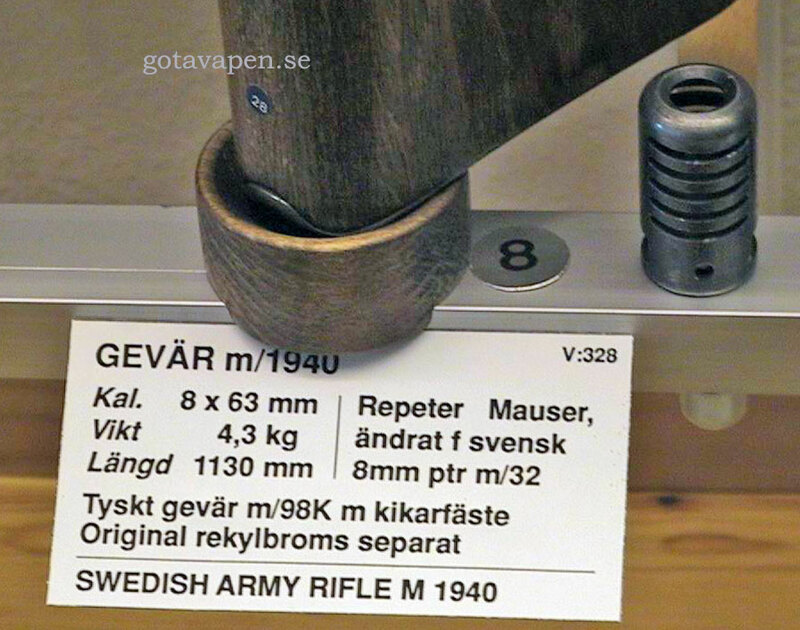 The Gev m/40 (see picture above) at Weapon Museum in Eskilstuna had such a rifle for display before it closed. 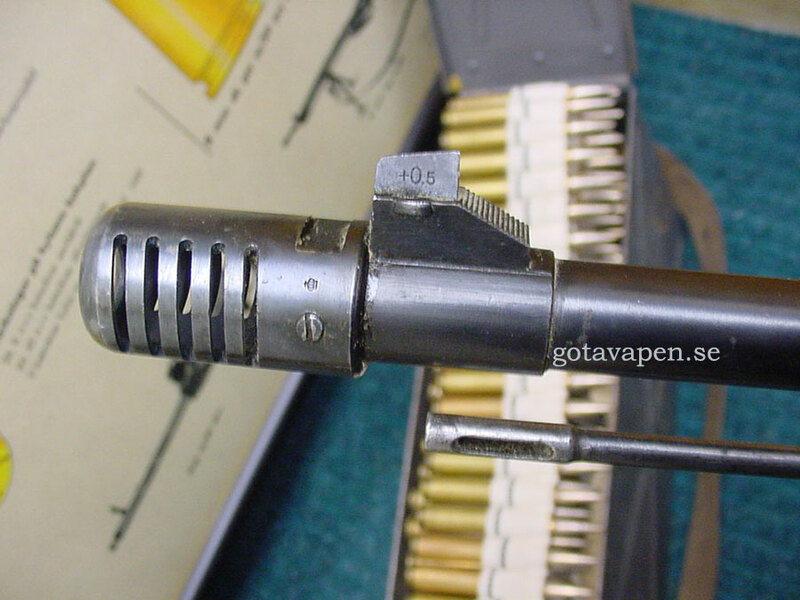 The muzzle break had a tendency to come loose and caused accidents, beside it was very unpopular among the soldiers. The rifle was withdrawn from the units and was later sold abroad. Arkiv 006 H Arméfärvaltningens Tygdepartement. Första materielbyrån. Inkommande och utgående skrivelser 1937-1942. Signum F Vol 18. Arkiv 224 H Carl Gustafs Stads Gevärsfaktori. Utgående skrivelser 1931-1943. Signum B Vol 2-6. Reibert / Der Dienstunterrcht im Heere. Ausgabe für den Schützen der Schützenkompanie. Datenblätter für Heeres-Waffen, - Fahrzeuge und - Gerät im Auftrag des Reichsrninister für Rüstung und Kriegsproduktion. Grenzschutzdiensvorschrift 9101 "Der Karabiner 98 k" E.S. Mittler & Sohn G.m.b.H. Darmstadt 1951. GDV 9301 "Das Reinigungsgerät 34 und seine Anwendung für Karabiner, MG. und Pistole"
Hans-Dieter Götz / Die deutschen Militärgewehre und Maschinenpistolen 1871-1945. Brandt, Hamann, Windisch / Die Militärpatronen Kaliber 7,9 mm ihre Vorläufer und Abarten. Karl Fischer / Waffen- und Schiesstechnischer Leidaden für die Ordnungspolizei. Akademische Druck- u. Verlagsanstalt Graz 1975.